In retrospect, the dosage of IV sedatives used in the early days of endoscopy both in the USA and Great Britain was frequently too high. Today we are much more careful in the way we sedate patients being acutely aware of the fact that if the patient becomes unresponsive and verbal contact is lost then, by definition, a general anaesthetic has just been administered with all the clinical and legal implications that this holds. This expertly written book examines all aspects of conscious sedation and will be an essential reference for nurses and other health professionals involved in the clinical care of patients undergoing diagnostic or therapeutic procedures that require conscious sedation. Each chapter covers a particular area of the practice of conscious sedation and the authors come from a wide spectrum of clinical specialities. 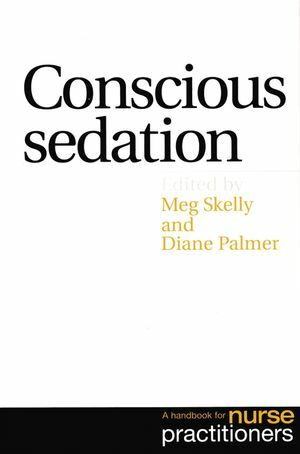 Meg Skelly is the editor of Conscious Sedation: A Handbook for Nurse Practitioners, published by Wiley. Diane Palmer is the editor of Conscious Sedation: A Handbook for Nurse Practitioners, published by Wiley. 5. Monitoring of The Sedated Patient. 6. Assessment of Sedation Levels. 7. Special Cases and Complications. 8. Professional and Legal Aspects.